Much welcomed fresh snow in the morning! As a Sierra Fellow, my role is to assist with the development of a basin-scale assessment and restoration framework for the fisheries of the Upper Feather River (above Lake Oroville). Read my first blog post here! Thankfully, snow and rain have continued to fall fairly consistently here in the Almanor Basin and across the state (a snow covered lawn makes a fantastic place for practicing fly-casting!). With these changes in season, the first phase of the Upper Feather River Basin-wide Native Fisheries Assessment and Improvement Strategy has entered full swing, and with it a number of interesting challenges and questions have arisen. What are the best database management systems and tools for use in this type of project? What are the capabilities needed from these systems and sets of tools to accomplish our goals? What is going to be the best way to share information produced for use by the scientific community and the general public? Another important concern is that the systems and tools used must be flexible enough to efficiently capture information from a variety of sources. The range of these anticipated sources include peer-reviewed literature, natural resource survey data from multiple agencies and private companies, as well as anecdotal information from interviews with local anglers. All of these questions have indicated a real need for thoughtful organization up front. In what format is the data recorded (hopefully, digitized in some manner!)? Getting acquainted with the watershed and some of the available fishery data! Because data on the Upper Feather has been collected by so many different entities over the years, relevant data varies in collection method, sampling protocol, and format, and is stored in locations across the state. Some of the needed data range in location from ranger district offices in the eastern portions of Plumas National Forest to California Department of Fish and Wildlife archives in their Sacramento area headquarters. Additionally, important information may be found in data that exists in the form of scribbled lines in a field notebook circa the 1950s, or a fully assembled online database and mapping tool. The discrepancies in depth, location, and accessibility of these available data create the base for my first major hurdle in advancing the data-collection phase of the Basin-wide Assessment. An additional source of valuable historic information on the quality of the fishery in the past can be found in the expertise of long-time anglers familiar with certain areas of the Basin. In order to acquire this information I will be capturing interviews with these individuals via recordings or videos, and use these accounts to assist in my understanding of historic distributions of different fish species. I mean to collect accounts from as many of these individuals as possible in order to examine the validity of information gathered via interview by looking for correlation with natural resource survey data collected in the same areas that they describe. If a correlation between survey-based distribution data and interview-based data is apparent it will be included in distribution analyses, utilizing the experience of these anglers as a wealth of informal sampling knowledge. Once all of these varying forms of data are organized and collated, there arises the task of representing this information geographically in order to determine where fish were located in the past and how that has changed over time. This information will provide some indication as to where habitat stressors affecting the fishery may be present or where conditions have remained stable, highlighting areas that may be most important to examine in a later assessment focused on habitat conditions. Habitat stressors can occur at various scales. They can be a landscape-wide phenomenon, such as excessive sediment loading from an eroding road system, or they can occur at the level of the stream itself, such as where an agricultural water diversion takes place. Consequently, I plan to represent species distributions in the Upper Feather River both at the watershed and stream level. Rainbow trout presence (in red) in a portion of the Upper Feather River Basin, displayed at the watershed scale, USGS 14-digit Hydrologic Unit Code (HUC). Data obtained courtesy of USFS. To display distribution by watershed, one potential method will involve symbolizing each watershed unit for species presence, absence, or richness (i.e. number of species). This representation can provide information on species abundance, both qualitatively (with categories like few, common, or abundant) and quantitatively (using specific species count numbers) depending on data availability and quality. An example of this representation appears above, which shows rainbow trout presence (in red) by watershed in and around the Lake Almanor basin. A map like this really elucidates the range of a given species, which is certainly an important piece of information, but perhaps not enough to make truly informed management decisions. It’s also necessary for resource managers to know what is affecting fish populations very near to and right within the place they live: the water!!! Chinook salmon distribution, displayed at the stream reach scale, for four neighboring foothill streams. Data obtained courtesy of CDFW. Another method is to display distribution by stream reach, which shows the extent of a species’ distribution on an actual mapped stream or river feature. Representing distribution in this way can yield significantly more useable information for management as it occurs on a finer scale than that of watershed-based representation. For instance, one species may use a certain tributary in a watershed while its non-native competitor uses that and two others, thus indicating that restoration should be focused where it might be of the most benefit to native species. An example of this representation looks like the figure above, which displays the extent of Chinook salmon distribution in four neighboring foothill stream systems. The data used for this example was retrieved from the California Department of Fish and Wildlife Biogeographic and Observation System (BIOS). Another powerful example is StreamNet, a regional forum for fish and aquatic habitat information management and data sharing in the Columbia River Basin that includes extensive reach level distribution data. I anticipate constructing datasets using both methods for the Upper Feather River Basin-wide Assessment and looking at each at various appropriate timescales and incorporating varying levels of data confidence. The assessment will include information on probable distribution in the geologic and prehistoric past. One way this information can be generated is through modeling historic habitat conditions and inferring distribution from the results but for this assessment this information will likely come primarily from literature review. However, synthesizing information from the available survey record of the last century, in the manner described above, will help managers to better understand trends that have been occurring over more recent decades and to make informed decisions therefrom. I hope to develop maps of displaying more- and less-conservative estimates of distribution by incorporating greater and fewer data sources, ranging from layers based solely on the conventional fish population sampling methods of electrofishing and snorkel surveys to layers incorporating all available data sources. I will be excited to share the results of these analyses and some powerful stories about the quality of fishery in the past that will hopefully inspire progress towards recovery for the future. Please comment with any thoughts, suggestions or pointers. EXCITING BEGINNINGS (AND A FEW COLD MORNINGS) HERE IN CHESTER, CALIFORNIA! 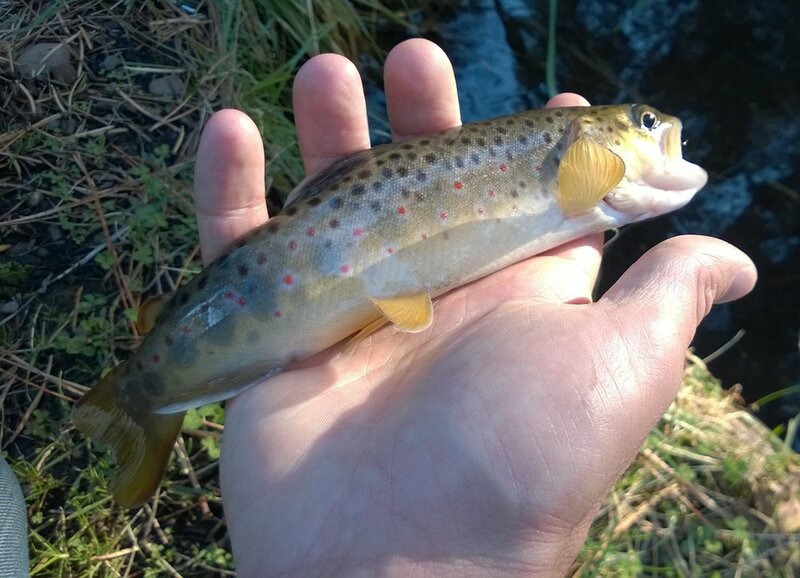 A small brown trout caught from Last Chance Creek just upstream of Chester meadow. Once heavily stocked by the Department of Fish and Wildlife, these fish compete with native rainbow trout populations. However, well-established wild populations also create valuable recreation opportunities and tourist attractions, and thus serve as a benefit for local rural communities. So… first, a little about myself, then a little about my project, my first month on board, and my efforts to begin creating a positive impact in the community surrounding my new home. Born and raised Northern California, I grew up moving between the small foothill and farm towns of the North State, exploring the outdoors when and wherever possible, and doing so primarily through angling. I attended the University of California, Berkeley, where I completed a BA in Geography and learned about the real value of working for positive impact on society and environment. Plug and pond meadow restoration treatment in the Red Clover Valley in eastern Plumas National Forest. Since then I’ve worked on Northern California land conservation as a Land Steward with the Sutter Buttes Regional Land Trust, where I was tasked with strategizingconservation efforts and monitoring the land trust’s conservation easements and real-property holdings. More recently, as a member in the AmeriCorps Watershed Stewards Program, I worked at the intersection of fisheries science, watershed-focused education, and community service. Working with the staff of the Marin Municipal Water District Fishery Program, I monitored the salmon and trout populations on Lagunitas Creek in West Marin, educated area classrooms, and coordinated volunteer habitat restoration events and citizen science initiatives amid other community outreach. I am excited to apply and expand upon the skills learned through these experiences over the coming year and consider it a pleasure and privilege to do so in service as a Sierra Fellow. Aftermath of the Moonlights Fire. Today’s devastating wildfires, the product of decades of misinformed management centered on fire suppression, not only affect forest health but also in-stream habitat conditions by creating unstable slope conditions and releasing massive amounts of sediment. This can negatively affect trout and other aquatic organisms. My project as a Sierra Fellow will consist of completing a Basin-wide Native Fish Assessment and Improvement Strategy for the Upper Feather River Watershed. The complete project area is comprised of the the four primary branches of the Feather River and all of their tributaries above Lake Oroville. This work will consist of assessing historic distributions of fish species within the watershed, investigating watershed and habitat conditions that affect fishery quality, and identifying current distributions of fish species using an exciting new sampling technique that reveals presence and absence of species by examining eDNA (environmental DNA, extracted from small bits of tissue suspended in the water column). I will then collate all of this information into a cohesive and comprehensive basin-wide restoration strategy for the watershed. An excavated pool on Upper Indian Creek, above Antelope Lake, created to aid the passage of spawning wild trout that migrate up from the lake; many road crossings and other culverts across the watershed are still in need of retrofit to allow such passage. My first month as a Sierra Fellow has been an exciting learning experience, consisting of getting to know the Plumas National Forest by touring watersheds, seeing the sorts of watershed degradation that has occurred in the past, visiting restored sites, strategizing project efforts with technical support partners, and in my free time exploring the streams and rivers near my new home in Chester. In addition to my work on the larger scientific initiative, as Sierra Fellows, it is important for us to integrate into the communities we now call home and create some positive impact therein. For my part, I am planning to engage with the community by promoting literacy through Plumas County Library’s literacy program. I will serve as a volunteer tutor to help strengthen the literacy skills of children and adults alike.